Here is a ZENIT translation of the address Pope Francis gave today when he received in audience participants in the annual Course on the “Internal Forum,” organized by the Apostolic Penitentiary. I am happy to meet with you, during Lent of the Jubilee Year of Mercy, on the occasion of the Course on the internal forum. I cordially greet Cardinal Piacenza, Major Penitentiary, and I thank him for his courteous expressions. I greet the Regent – who has such a good face, he must be a good confessor! 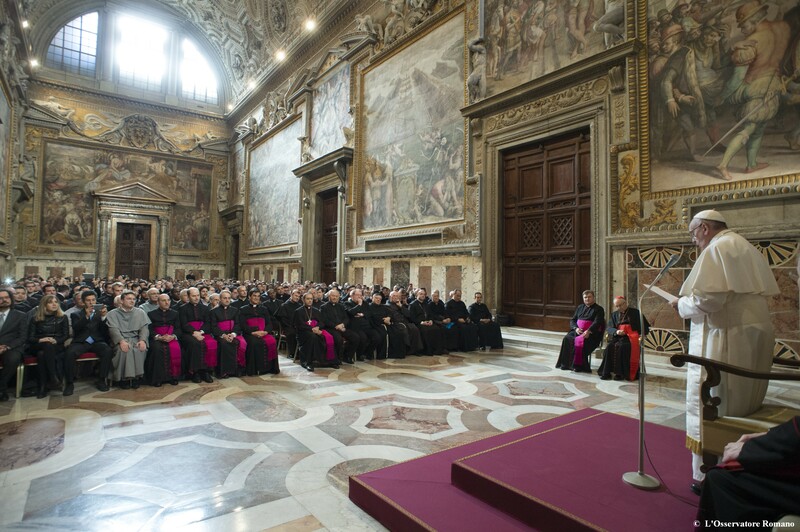 – the Prelates, the Officials and the Staff of the Penitentiary, the colleagues of the Ordinary and Extraordinary Penitentiaries of the Papal Basilicas – whose presence, in fact, has been extended, on the occasion of the Jubilee – and all of you participants in the Course, which hopes to help new priests and soon to be ordained seminarians to form themselves to administer well the Sacrament of Reconciliation. In fact, the celebration of this Sacrament requires an appropriate and updated preparation, so that all those who approach it can “touch the grandeur of God’s mercy with their own hands. [So that for] every penitent, it will be a source of true interior peace” (Cf. Bull Misericordiae Vultus, 17). Mercy “might well sum up the mystery of the Christian faith. Mercy has become living and visible in Jesus of Nazareth, reaching its culmination in him” (Ibid., 1). In this sense, before being an attitude or a human virtue, mercy is God’s definitive choice in favor of every human being for his eternal salvation — a choice sealed with the blood of the Son of God. This divine mercy can reach freely all those that invoke it. In fact, the possibility of forgiveness is truly open to all, rather, it is open wide, like the largest of the “Holy Doors,” because it coincides with the heart itself of the Father, who loves and awaits all His children, particularly those who have erred most and are far away. The Father’s mercy can reach each person in many ways: through the opening of a sincere conscience; through the reading of the Word of God, which converts the heart; through a meeting with a merciful sister or brother; in the experiences of life that speak to us of wounds, of sin, of forgiveness and of mercy. There is, however, the “sure way” of mercy, which goes from the possibility to the reality, from hope to certainty. Jesus is this way, who has “the power on earth to forgive sins” (Luke 5:24) and has transmitted this mission to the Church (Cf. John 20:21-23). Therefore, the Sacrament of Reconciliation is the privileged place to experience God’s mercy and to celebrate the feast of the encounter with the Father. We forget this last aspect with such ease: I go, I ask for forgiveness, I feel the embrace of forgiveness and I forget to celebrate. This is not theological doctrine but I would say, forcing somewhat, that the celebration is part of the Sacrament: it is as if penance is also part of the celebration I must have with the Father who has forgiven me. When, as confessors, we go to the confessional to receive brothers and sisters, we must always remember that we are instruments of God’s mercy for them; therefore, let us be careful not to put obstacles to this gift of salvation! The confessor is, himself, a sinner, a man always in need of forgiveness. He, for starters, cannot have God’s mercy fail, who “chose” him and “constituted” him (Cf. John 15:16) for this great task. Added to it, therefore, must be a humble and generous attitude of faith, having as his sole desire that every faithful might have the experience of the Father’s love. Not lacking in this are holy fellow priests to whom we look to. We think of Leopoldo Mandic and Pio of Pietrelcina, whose mortal remains we venerated a month ago in the Vatican. And also – I allow myself to say – one of my family: Father Cappello. After the priest’s absolution, every repentant faithful has the certainty, through faith, that his sins no longer exist. They no longer exist! God is Omnipotent. I like to think that He has a weakness: a bad memory. Once He forgives He forgets. And this is great! The sins no longer exist, they were cancelled by divine mercy. Every absolution is, in a certain way, a jubilee of the heart, which rejoices not only the faithful and the Church but, especially, God Himself. Jesus said so: “there will be more joy in heaven over one sinner who repents than over ninety-nine righteous persons who need no repentance” (Luke 15:7). Hence, it is important that the confessor be also a “channel of joy” and that the faithful, after having received forgiveness, no longer feels oppressed by his faults, but can relish God’s work, which has liberated him, live in thanksgiving, ready to repair the evil committed and to go to encounter brothers with a good and willing heart. Dear brothers, in this our time, marked by individualism, by so many wounds and the temptation to close oneself, it is a true and proper gift to see and accompany persons that draw near to mercy. This also implies for us all an even greater obligation of evangelical coherence and paternal benevolence. We are custodians, and never masters, either of the sheep or of grace. Let us put back at the center – and not only in this Jubilee Year! — the Sacrament of Reconciliation, true space of the Spirit in which all, confessors and penitents, can experience the only definitive and faithful love, that of God for each of His children, a love that never disappoints. Saint Leopold Mandic used to repeat: “God’s mercy is superior to any expectation of ours.” It was also usual to say to one who suffered: “We have in Heaven the heart of a mother. The Virgin, our Mother, who at the foot of the cross felt all the suffering possible for a human creature, understands our troubles and consoles us.” May Mary, Refuge of sinners and Mother of Mercy, always guide and support the fundamental ministry of Reconciliation. And what should I do if I find myself in difficulty and cannot give absolution? What must be done? First of all, see if there is a way, so often it is found. Second: not to be bound only to the spoken language, but also to the language of gestures. There are people who cannot speak, and express their repentance, their sorrow with a gesture. And third: if absolution cannot be given, speak like a father: “Listen, I cannot [absolve] you for this, but I can assure you that God loves you, that God waits for you! Let us pray together to Our Lady, to protect you; and come, come back, because I will wait for you as God waits for you,” and give the blessing. So this person comes out of the confessional and thinks: “I found a father and he did not beat me.” How often have you heard people say: I never go to confession, because I went once and he shouted at me.” Even in the limited case in which one cannot absolve, <the penitent> must feel the warmth of a father, who blesses him and tells him to come back! — and also to pray with him or her. This is always the point: there is a father there. And this is also a celebration, and God knows how to forgive things better than us – but at least let us be image of the Father. I thank the Apostolic Penitentiary for its precious service, and I bless you all from my heart and the ministry you carry out as channels of mercy, especially in this Jubilee time. Remember, please, to pray for me also. And today, I will also go there, with your penitentiaries, to hear confessions at Saint Peter’s.